For policymakers a sense of timing doesn’t appear to be among the highest qualities demanded. That certainly applies to almost every economic proclamation that has come out of any central bank globally, as they both fail to ever see forming recession and always proclaim recoveries that don’t happen to exist. It’s not just a matter of jumping the gun, it is getting the sign wrong and timing (especially in their models) has a lot to do with that. Just today, however, Janet Yellen seems to be making the same kind of case only this time in relation to asset bubbles. 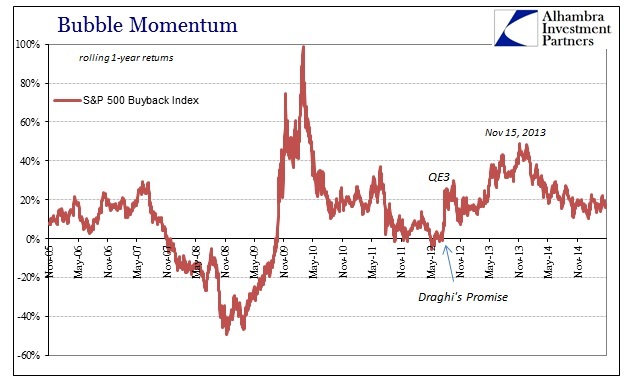 While not directly acknowledging the Fed’s role here, not as a matter of those trillions in bank “reserves” due to four QE’s but rather as the projected monetary intentions to eliminate “tail risk”, the Fed Chair found it suitable to warn at this time that stock valuations might be off. Yellen’s view on the run-up in stocks was an answer to questions from International Monetary Fund Managing Director Christine Lagarde, who joined the Fed chief for the opening session of the “Finance and Society” conference here. “We’ve also seen the compression of spreads on high-yield debt, which certainly looks like a reach for yield type of behavior,” Yellen said. In general terms, it would seem far wiser to give such counsel before the stock bubble gets out of hand rather than now when it may already have (and then some). The only manner in which it may make sense to keep quiet is if stock prices actually hold some economic sway, as in the once-believed “wealth effect” that drove Bernanke to such heights of confidence (by contrast to the shell of his former self today, battered by such realities). That seems to be the point here, and if you survey enough of Yellen’s coded words you get the sense that is hers as well.  In other words, the economy never did get its asset price boost from what surely is shaping up much like a bubble, but now the bubble remains with the economy in much worse shape than what was expected to absorb that downside. As with other factors, even Bernanke’s FOMC was aware of the potential cost of sowing such large asset imbalances (“reach for yield” was first widely discussed in February 2013 by then-Fed Governor Stein) but surmised that would be far more manageable under robust economic growth they were sure would result from it. In fact, they were so sure of such imbalances that they apparently thought it better to undertake the bubble and risk its collapse then to leave it alone and allow the economy to continue to languish. Unfortunately for all of us, the economy did so anyway. The point of Yellen’s intrusion is, I think, one of time. 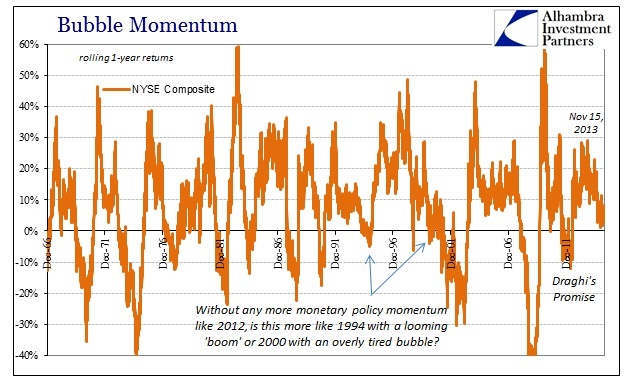 This bubble is growing tired, and momentum is seeping out of it – if only slowly. I’m surely not proclaiming a top here, as I have no idea when that would occur and neither does anyone else, but the warning signs are accumulating. For one, the broader stock market has barely gained in the past year. The NYSE Composite Index is basically unchanged since the “dollar” began to “rise” all the way back to the beginning of July 2014. The S&P 500 large cap version of the “market” is better positioned, but that is as much stock repurchases and internal corporate (and bubble) flow as anything else. What I think is interesting, noting the buyback support for the 500, is that even the S&P Buyback Index has broken its formerly insuperable upward trend. 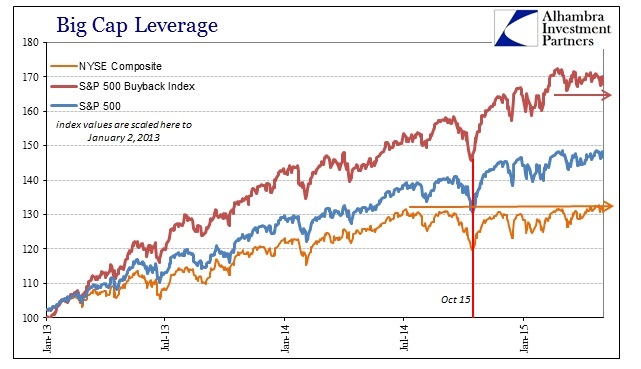 Since the middle of February, even the Buyback Index has taken to treading water rather than its relentless rise of the past few years. I couldn’t begin to speculate on why that may be, other than these more general trends toward bubble exhaustion. If you look at these “markets” through the perspective of “momentum” I think that point becomes clearer. Using rolling 1-year returns, the underpinning of all the stock pieces is illuminated as a factor of either monetary policy alone or monetary policy as an agent for intended and expected economic strengthening. In terms of “momentum”, the same pattern is easily observed in all three of these stock indices which more than suggest this general, artificial basis. By the middle of 2011, stock markets had clearly lost their prior recovery momentum as serious financial and economic risks appeared. 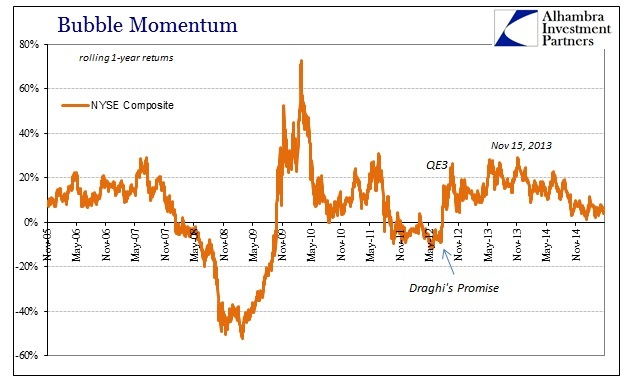 Those worries carried over into 2012 (rightfully so, as it turned out, with 2012 marking a global and sustained slowdown) but stocks were turned upward right at the very moment Mario Draghi promised to “do whatever it takes” to save the euro (thus, once again, providing solid evidence linking finance among euros and “dollars” and almost everything in between). QE3 and then QE4 were added later and stocks were off to the races, skyrocketing throughout 2013. Even the huge and dramatic bond selloff/MBS crash in the middle of that year failed to deter stocks. That momentum carried forward until the middle of November 2013, the exact same timeframe (distanced only by a few days) where the bond market began its own bearish inclinations. 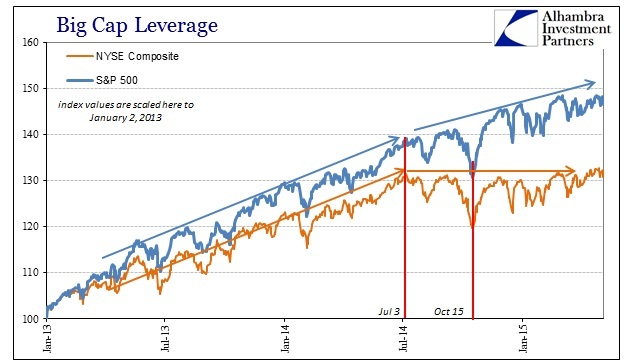 As has been observed throughout credit markets, November 2013 has remade the trajectories of everything from junk corporate credit prices to the treasury yield curve and beyond. It seems as if the stock market was also affected, if only gently driven off its then-non-linear course. I still have no idea what happened then, but it is clear it was extremely relevant to almost every financial factor and feature. 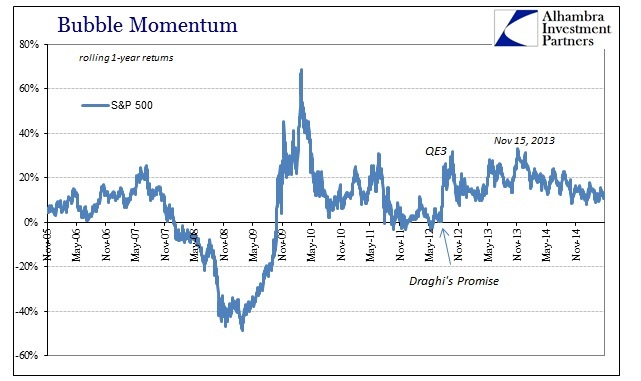 It seems most logical that that period relates to the monetary policy promise of QE and Draghi; if it was mid-2012 monetary policy introductions that sparked the huge burst of momentum it was the realization that they were going to be unwound that came to be the most animating facet. The difference here, I think, is that financial agents have been betting an increasing likelihood that the unwind phase was going to take place without the economy that was once promised by those policy stances. However, it hasn’t been completely and unambiguously clear on that point, as the FOMC itself continued to pound away on its recovery narrative while on the other hand almost nothing lived up to it. I think that is ultimately what was so drastic about November 20, 2013, as it was the intersection of the lines of thinking about where monetary policy was going to end and where doubts about its economic promises finally overcame blind faith in them. If there was a financial “event” to go along with that inflection, as I think there surely was in the wholesale system somewhere, that would only serve to confirm that any exit was going to be messy but that there was an increasing risk that the mess would not be comforted in the recovery everybody was counting on. As this is a slower shift of exchanging possibilities, that would account for first dragging forward momentum and then, as with the “dollar”, a nearly year-long pause to further recognize these risks that are becoming far more “real” (especially with the “dollar”). If you look at stocks longer-term with this momentum perspective, the loss of it is usually quite serious. With the exception of the Greenspan/soft landing drama (crap) of 1994, getting the 1-year return close to zero usually leads to a “bear market.” In that sense, perhaps, the stock action in mid-2012 makes slight sense as investors were behaving as if it might be that 1994 scenario all over again, which would have been the “best” possible case. Instead, it is increasingly confirmed that the economy we are facing is nothing like the 1994 version (even the employment factor is losing its allure more recently), instead potentially more like 2000 and its first real rejection of monetary efficacy. 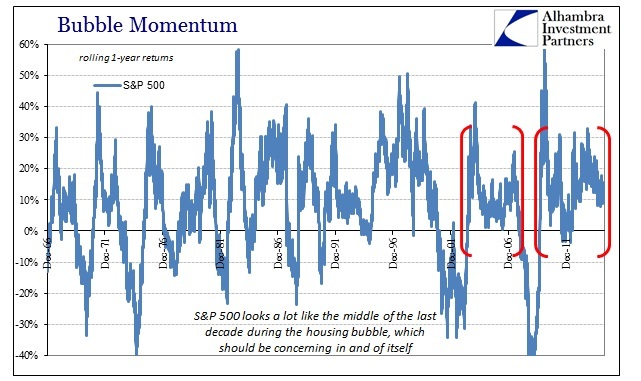 In terms of the S&P 500, the loss of recent momentum is not quite as severe, but that only leaves the “market” looking more and more like itself from the middle of the last decade. Again, the commonality there as now is great monetary promise with increasing speculation about its actual delivery (as anything other than financial imbalance and whatever unstable and inefficient economic activity that may go along with it). 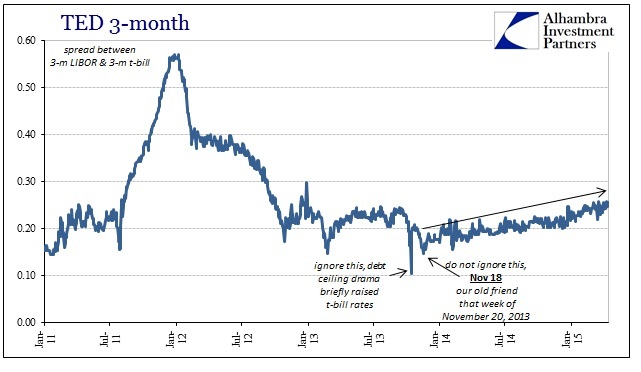 In that overriding sense, 2012’s monetary injections are coming back circling as unfulfilled promises. That is where Yellen’s words sting the most, as in hindsight it would have been perhaps far better for the lackluster economy to degrade now without all the bubbles since it appears is it was going to anyway. While the monetary officials apparently need that hindsight, common sense was there all along. As it was, there were two prior asset bubbles (really three separate cases, and crashes) from which to observe exactly this point. That is the danger of the lack of momentum, as momentum serves as an indirect proxy for belief and rationalizations. Once they fade away it is harder to deny reality any longer. At the very least, top or not, it seems as if investors all across the financial landscape are themselves are losing faith not just in monetary policy and the economy but maybe even the idea that this was anything more than yet another bear market rally. Even Janet Yellen might think so; after all the “dollar” beat her to it.